FreshBI | Games | Games In Power BI: Are we Crazy? Communication is an essential part of every business; so is their data. Often we find ourselves at odds with how to communicate specific analytical insights. Bookmarks in Power BI act as 'saved states', these states are the solution to many communication problems. This is the tie between bookmarks and your business. Having the ability to dig deeper into your report, perceive something useful, and then create a bookmark that can communicate your perception will yield great value. Bookmarks help in the journey of creating a story. Often as the scope of a report becomes more and more extensive it also becomes harder to navigate and interpret meaning from the report. Bookmarks help with this by enabling report designers to simplify and narrow down certain data when necessary. Telling a story with your data is a hard but essential concept to master. Engaging with data is the first step to meaningful insights. Bookmarks are an easy tool for producing a creative narative in your reports. As mentioned, it is very common for reports to become very cluttered. Bookmarks can be used to hide visuals in a report and thus can be used as a very efficient tool for highlighting important metrics. On a similar vein to using bookmarks to highlight important measures in your report, bookmarks can be used to create a report with a dynamic layout. By layering visuals in Power BI and then creating book marks that hide one and un-hide another we can create a 'swapping' effect. This can allow for a user to be able to swap between visuals on a single page. Creating data drill downs is a another more specific tool for bookmarks in Power BI. Sometimes the importance of the data behind a visual is expanded on with a easily accessed data table linked to the visual. Since bookmarks are so flexible, they open up a whole other aspect to reports in Power BI. This realm is purely up to your imagination. So, I say we go ahead and make a game! 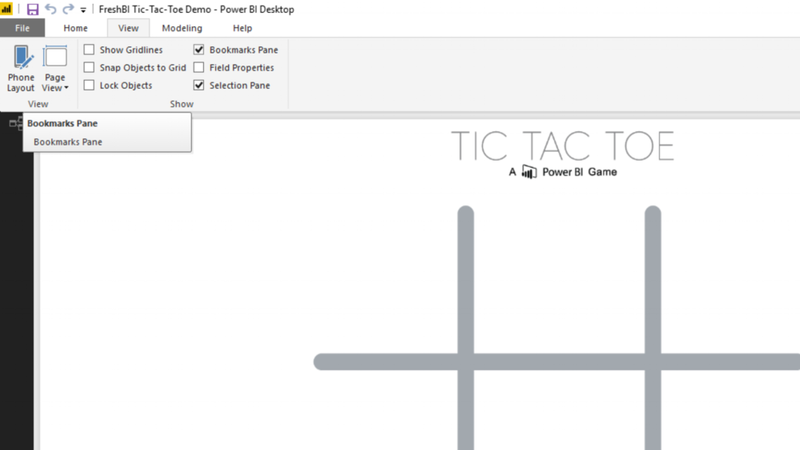 What Steps are Required to Build Tic-Tac-Toe in Power BI? The Process for creating Tic-Tac-Toe in Power BI is actually quite straight forward. The approach that we took involved following a sequence of steps in order to create an interactive square on the board and then rinse and repeat nine times to fulfill our goal. Set up is critical: Power BI does not begin with the tools you need enabled. Limiting your bookmarks scope to only a few visuals at a time is very important. Organization is extremely important when you are working with so many similar visuals. Naming visuals for bookmarks is not intuitive; but it is easy and a lifesaver. Once we have bookmarks enabled we have to enable the Bookmarks, and Selection Pane from the View tab. Alright, before we get started we must go ahead and enable bookmarks in the options menu. We navigate File -> Options -> Preview Features check bookmarks. You may have noticed that it is not easy to rename our visuals in the selection pane. This is normal and a way to work around this is to enable the title in the formatting pane, put your name in the title, and then disable the title afterward. I am naming my images to create out top left square, hence the naming convention. Now that bookmarks are enabled we want to upload our images. We have these three that will do the job nicely. With our three visuals still selected we need to limit the scope of our bookmark to only effect these three. To do this we click the ellipses to the right of Bookmark 1 and choose 'Selected Visuals'. This limits the visuals that our bookmark modifies. Now we are ready to create our first bookmark. Select the visuals you want to be in this book mark. We want out X, our O and our Blank (B) shape. The reason we are choosing these is so that they will swap B -> O -> X. Now that we have our bookmark and its scope set, we must update the state that our bookmark saves. Our goal is to create one bookmark for each visual to show. So first we are creating the 'just O showing' bookmark. So set the X and the B to be hidden under the Selection Pane and then click 'Update' through the ellipses next to the bookmark. We now have our first bookmark set up. Our first bookmark just displays the O. So now we repeat with the goal of creating the other two bookmarks, one to show only the X and the other to show only the blank. After we have set up our three primary bookmarks we need to include our restart bookmark. (Keep in mind that If I were implementing all squares we would save this for last) Again we un-hide all visuals and created a new bookmark. We want this bookmark to effect all visuals. So set this bookmark to make only the blank shape visible. And then update the bookmark. Remember that if we had all nine tiles in this report we would want this to make all squares just show blanks. Lastly, we create links from each of our images to our bookmarks. Un-hide the O visual and select it. In the formatting pane, enable 'links', choose 'Type' to be 'Bookmark' and set the Bookmark to point to our X bookmark. Repeat with the X visual to link to the B bookmark, and with the B visual to link to the O bookmark. 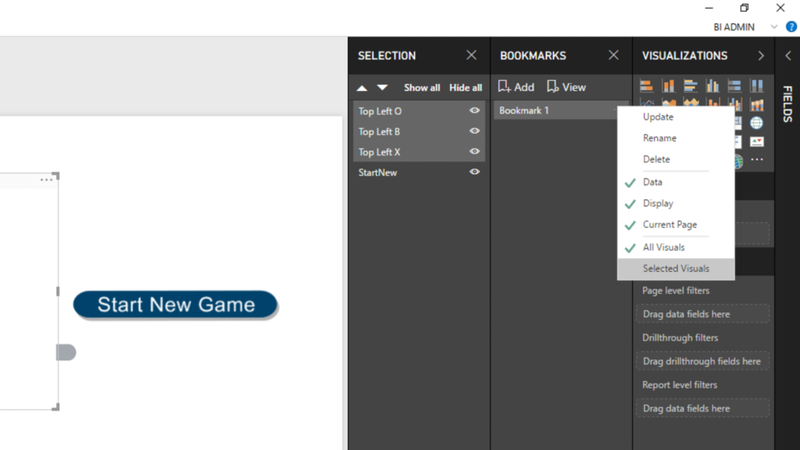 The last one is to select the 'Start New Game' visual and set it to link to the B book mark. Now that we have all of our bookmarks and visuals set up. We arrange our X, O and blank image to all be overlapping in our desired square. 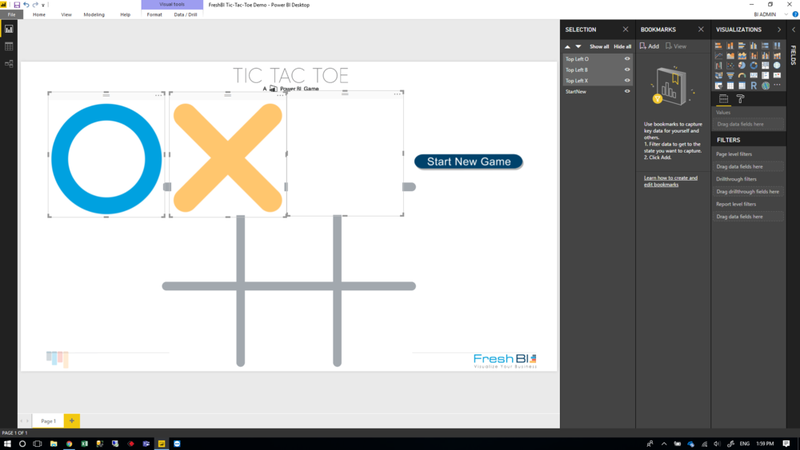 We have now successfully set up our first square of Tic-Tac-Toe in Power BI! The rest of the game is created by repeating the above 12 steps for each square. I suggest keeping a very tight naming convention as you proceed through each step. It will get quite busy. Good luck! How Can This Add Value to my Business? Time: Using bookmarks in Power BI enables you, to communicate your observations and perceptions more clearly and without hassle. They allow you to lead. You will save time in droves as you adapt and utilize the maneuverability that bookmarks provide. Cost: Bookmarks will give you value as a consequence to saving time. Bookmarks provide a faster and easier report creation process. As you become more robust in your bookmark creation, you will become more advanced and proficient in report design. This process in invaluable to anyone in business and will promise a quick ROI. Analytics Availability : The techniques open to your fingertips while learning and implementing bookmarks are awesome. Bookmarks provide a whole new opportunity for observation and analysis. The stories that are portrayed through a well build report are imperative to expanding your analytical toolbox. BI Apprentice - Software Development and Report Design. Honors in theoretical mathematics/minor in computer science.